BURKA PUN LEADS TO MUSTARD RIOTING, ONCE ANCIENT CHURCH GOES UP IN SMOKE……. – The Tundra Tabloids……. BURKA PUN LEADS TO MUSTARD RIOTING, ONCE ANCIENT CHURCH GOES UP IN SMOKE……. 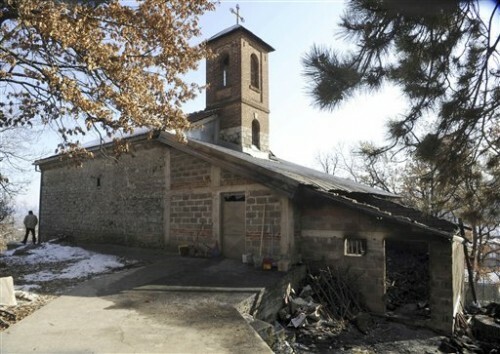 (UKPA) — An Orthodox Christian church famed for its valuable icons was set alight in southern Macedonia overnight amid religious tension between Christians and minority Muslims over a carnival in which Orthodox Christian men dressed as women in burkas and mocked the Koran. Previous Post Previous Post NEW DEMOCRATIC EGYPT: 73 DEAD IN MASSIVE FOOTBALL HOOLIGAN CLASH……..
Next Post Next Post INTERVIEW OF AUSTRALIA’S Q SOCIETY DEPUTY PRESIDENT, A FORMER MULTICULTURALIST……. Macedonian Muslim leaders called for restraint but also accused the government of educating the public. The solution is simple. If the Muslim Albanians don’t like the Macedonian way of life just go back to Albania.